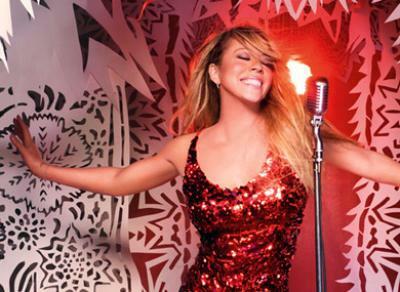 To use her words, Mariah Carey is having a Christmas music moment. Merry Christmas, her 1994 holiday album, yielded the seasonal staple “All I Want For Christmas Is You.” "Oh Santa!,” the first single from the 40-year-old Grammy-winner's successful new yuletide sequel, Merry Christmas II You, is perched atop Billboard’s Adult Contemporary chart like a perfect angel. Before she gets festive this week in her ABC holiday special Mariah Carey: Merry Christmas to You, Carey, expecting her first child with husband Nick Cannon, regifts the love of her loyal gay fans — and stuffs our stocking with the truth about her night with Lindsay Lohan. Advocate.com: No one does contemporary Christmas pop like you, Mariah. Do you really love the holidays, or are you just faking it? Mariah Carey: You can’t really fake that. I don’t think people who don’t love Christmas could translate that into a great Christmas song. People ask me, “How do you make these songs feel like they’re already classics?” The point is that I do love the holidays so much, and I love writing songs and making records, so it seems like a natural fusion for me. I did the first Christmas album so long ago, and then every year I’d listen to it and pick it apart. So I needed to make a new Christmas album for myself as well as for the fans. I wanted an album that I could listen to during the holidays. I’ve read reports that your holiday repertoire might be made into a Broadway musical about your life as early as next year. What’s the real story? It definitely wouldn’t be about my life; start that rumor and they’ll never lose it, so make sure people know it’s not about my life. Right now we’re working on finding a script. We’ve been in discussions with HBO for over three years now. Everybody’s been very supportive of the project, but nobody wants to accept a script that’s not amazing. Anybody out there reading this who’s a writer or writer-in-training, we’re definitely accepting different ideas right now. Because it’s so important to me, I don’t want to make a mistake and have the script not be as good as the music. I want the script to be better than the music. You’d rather debut your musical on TV than on Broadway? A long time ago, the first idea I had was for it to be on Broadway and hopefully become a perennial. Then we spoke with HBO and got into discussions about making a movie musical. So it wouldn’t be a TV movie, because it’s not TV, it’s HBO. Marc Shaiman, who worked as a writer-producer on Merry Christmas II You, would certainly be an asset on that musical project. I love Marc Shaiman. He’s amazing, and I’d love to work with him again. Randy Jackson introduced me to him. When we sat down to write at the house in L.A., it was an amazing experience. After that, I was like, “He has to do the orchestrations for the entire album, because nobody else is coming close to what he’s doing, even in his demos.” And he’s hilarious. Being with him in person is almost as good as his e-mails. Last year you made magic with filmmaker Lee Daniels in Precious, and now you’ve created another holiday miracle with Marc Shaiman. Not to detract from their talent, but is there something special about gay men that makes them a perfect creative match for you? I mean, how could I say that there’s not? I can’t generalize too much because straight people I work with will be like, “Well, what does that say about me?” But it is true that there’s a certain chemistry there. Yes, their talents are gigantic, but they’re also open-minded, and it’s all about the shared references. I really clicked with Marc when we wrote our first song together, “Christmas Time Is in the Air Again,” because our references were so similar. His are way deeper than mine in terms of standards and older Broadway stuff, but he was surprised that I knew old standards that most people don’t know, because my mom would sing them when I was really little. And Lee’s another one that you just can’t help but love. He’s got his own unique personality, and we share so many of the same references as well. I can’t even think of all the crazy things we quote and laugh about. Whether it’s those surprised concertgoers on Oprah last year or the “Party in the FIP” boys who just made a YouTube video for “All I Want for Christmas Is You,” your gay fans aren’t shy about expressing their love. When did you first feel that support from the gay audience? I’ve never really categorized it like that. But I’ve always been able to connect with different kinds of people, because whoever connects with me realizes that I do truly appreciate and care about them. And... wait, what was I saying? You touched on something I wanted to discuss... Sorry, when you’re pregnant you don’t remember things from one second ago. Your connection with gay fans. Yeah, maybe part of the connection is that I do write songs from an outsider perspective. A lot of my die-hard gay fans don’t just know my singles, but they also know all the album cuts. I have songs about feeling different and alienated, because I grew up with my own issues, being biracial and not having money. Some of those lyrics can apply to anybody who feels different. My die-hard gay fans listen to songs like “Outside” and “Close My Eyes,” songs that most people wouldn’t know, and these songs have become anthemic for them for their own personal reasons. Do you have any words of encouragement for the young victims of antigay bullying? It’s horrible that it’s almost 2011 and this is still going on, but I don’t want to get on my podium and say, “Just keep believing!” — I know that’s cliché, and it would be typical of me to say something like that. It’s almost impossible to say anything, really, except you must be aware that dealing with that in high school is a passing place. You have to stay strong, rely on your true friends, and try to get through it, as opposed to drowning in it. Look at how many people suffered during high school and came out of it a better, stronger adult. That’s the thing to focus on. You also returned the support from gay fans last year when you invited a young gay couple onstage at a Las Vegas concert to help facilitate their marriage proposal. If two people want to get married, it’s their prerogative — we hope. Everybody should be able to do what they want to do and be in the pursuit of happiness. Ever since I was a little girl, my mother was very open-minded and had many different types of friends, so being gay never seemed wrong or strange to me. Her best friends were a gay couple, Ernie and Mort, and they kind of co-raised me. They were the nicest guys ever, and they would watch my little shows when I’d sing. Today, I guess they’d be called my guncles. Sometimes they’d put us up when we didn’t have a place to go. I couldn’t wait to go stay at their house because it was so beautifully done. Are they still in your life? One of them passed away. They weren’t together at the very end, but they were together for a long, long time. Back to your gay fans, Marc Jacobs’s ex-boyfriend Jason Preston got a big tattoo of your name on his stomach a few years ago. Isn’t that a bit much? I’ve seen it. How can I say it’s a bit much? No, it’s amazing. I mean, it is very surprising when you see something like that, but he’s a fun guy, so I thought it was adorable. Is Nick comfortable around your gay friends? He’s fine. Honestly, he does his own thing and doesn’t really care what anybody else is doing. He’s just living his life and being happy. How might you and Nick handle it if your child turned out to be gay? I guess we’d handle it as best we could in terms of being supportive. You strike me as one of those people who might secretly hope for a gay son. [Laughs] I just hope for whoever’s going to be happy and that I can be a great mother to. What if you have a little lesbian who won’t wear your tight hand-me-down dresses and butterfly jewelry? No comment. [Laughs] No, the thing is that you can’t try to make somebody something they’re not. Everybody’s like, “Oh, if she has a girl, everything’s going to be pink, blah, blah, blah.” But I don’t think you should go totally overboard on that. You should wait and see what the child wants. What do you think about today’s female artists like Lady Gaga, Katy Perry, Nicki Minaj, Ke$ha, and Christina Aguilera, who flirt with bisexuality in their lyrics, videos, and in the press? Many view it as a disingenuous marketing strategy. Maybe it’s more a reflection of society becoming more accepting. Some of those different artists might really be expressing themselves, but yes, some might just be looking for a little more attention. You never know. Bisexual rumors have surrounded you for years. If it makes somebody happy to say that, then whatever, but that’s not the reality. I don’t have a discriminatory policy of who I’m friends with, so yes, I’m friends with women who are gay — gay, straight, it doesn’t matter to me. So I don’t get upset when I hear that, because it is what it is. I guess I could lie about it to seem more exciting. Is it true that Lindsay Lohan has tried to seduce you? No, but I have hung out with her at a club. She was with Sean Lennon, and they came over. I remember he was playing my Hello Kitty guitar, and we were all just singing, laughing, and making up songs. It really couldn’t have been more innocent. Some reviews have referred to Burlesque as the new Glitter. Have you seen it? I haven’t seen it, and I don’t feel like sitting in a movie theater right now. I can barely lie in bed and be comfortable. First I’m going to go see Elf, the Broadway musical, because I’m very focused on my Christmas music moment. But maybe I’ll see it when it comes out on DVD.